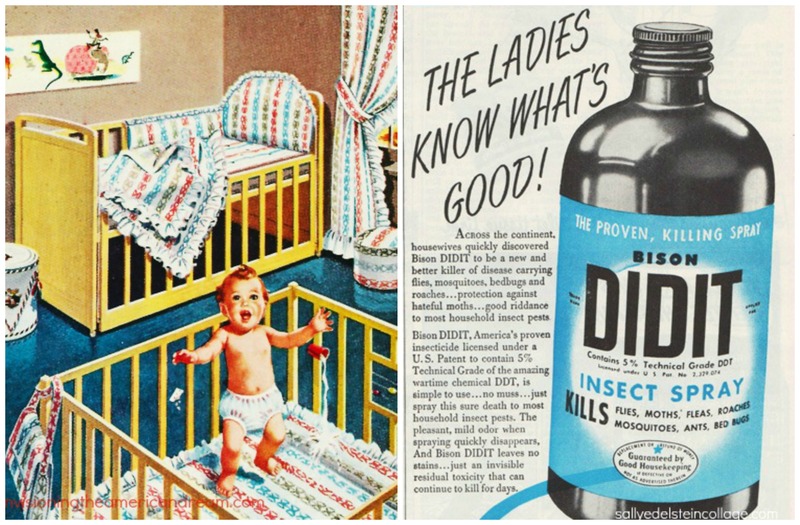 Just as mid-century garden nurseries were busy preparing for spring, filling their shelves with packets of seeds and cans of DDT, so American parents were diligently decorating their baby nurseries with happy-go-lucky wallpaper coated with protective DDT. In the last weeks before my late March birth, my baby-bound mother Betty was busy preparing for her new baby in our new house. After all, there was so much to do to get ready for that little bundle of joy, and my nursery was not yet completed. The enchanting sheer pink organza curtains to let in lots of cheery light had been bought and a soft plush pink rug underfoot for me to crawl on had been installed. But the nursery walls were woefully bare. Something cheery and springlike seemed in order. She couldn’t wait for me to soak it all in. But first sign of spring would also bring the flies and ants marching through our suburban house. Mom would be right in step behind them, her aerosol can of Bug a Boo spray poised to douse the entire house. In large, can’t-miss-print, the can boldly boasted, that it contained DDT that far exceeded the US Government standards for insecticides. From the time she was a little girl, no insect put the fear of God in my Mom and grandmother like the housefly. It was no wonder people of a certain age had a fear of insects and flies. These deadly pests, they were told, were carriers of deadly diseases. 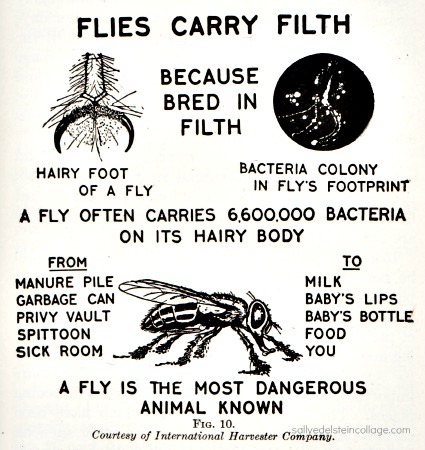 All insects were bad but houseflies were by far the worst since it was thought you could get polio through an insect bite. The fly, this most feared and dangerous beast that frolicked and feasted greedily in uncovered garbage cans, the gutter, rotting food, or a dead horse even, could have landed on your nice ripe peach wiping his poisonous feet on the food. The thought of a fly landing on her baby sent shivers through Betty’s spine. But as luck would have it, science would come to my rescue. It was at her final obstetrician appointment that my mother learned the perfect solution; one that would offer protection for her baby and solve her nursery decorating problems. To think her doctor was a decorator too! Just in time for my spring birth a new wall covering appeared on the market that would be perfect for my nursery-a colorful. cheerful children’s wallpaper infused with DDT promising unsurpassed protection for your child against disease carrying insects. 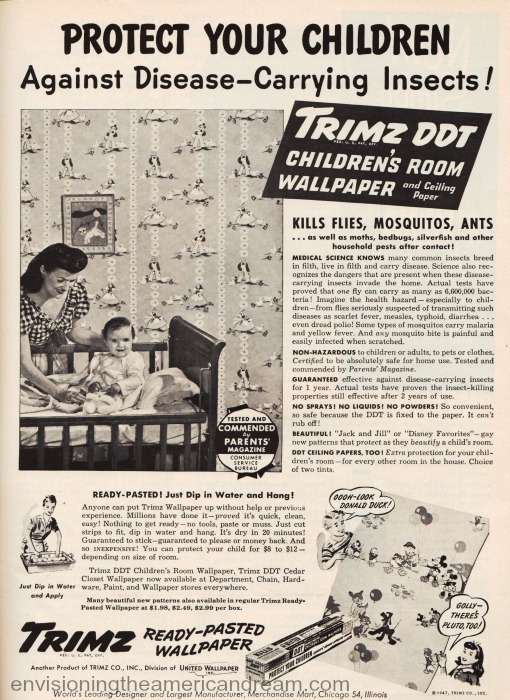 “Tested and commended by Parents Magazine,Trimz DDT children’s room wallpaper kills flies, mosquito’s and ants on contact,” the doctor told Mom handing her a brochure to read. “Medical Science knows many common insects breed in filth, live in filth and carry disease,” Mom read shuddering in agreement. “Science recognized the dangers that are present when these disease carrying insects invade the home. Actual tests have proved that one fly can carry as many as 6,600,000 bacteria! 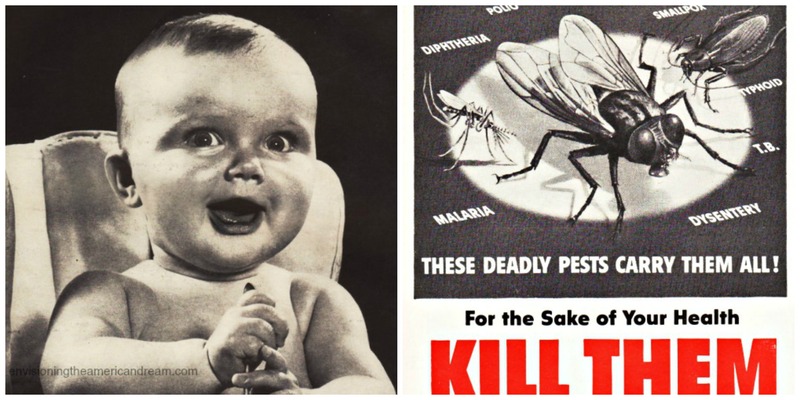 Imagine the health hazard- especially to children- from flies seriously suspected of transmitting such diseases as scarlet fever, measles, typhoid, diarrhea…even dread polio! Here was a war born miracle so amazingly effective you could scarcely believe it. Years later we would discover it’s effects would be longer lasting than that. Yes, mid-century spring was pure celebration of nature…or man’s conquest of nature. 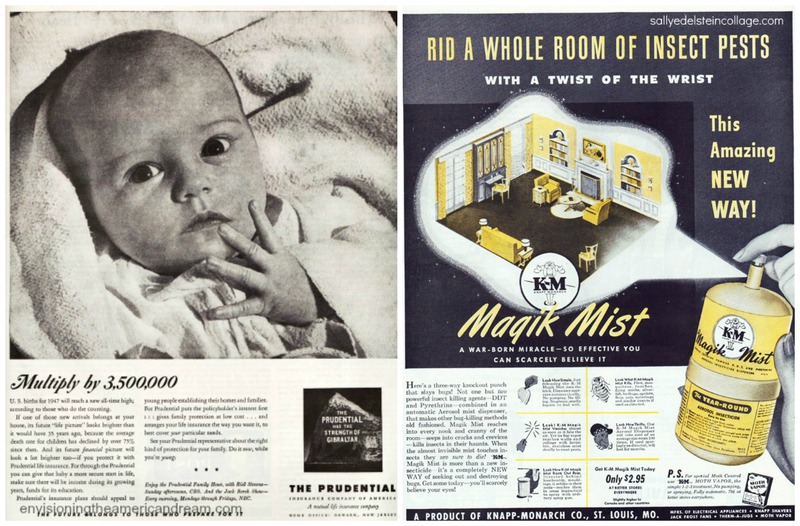 Like most folks, Mom wondered in amazement: How can the chemists and the people who produce these products to sell, keep coming up with so many ingenious new services, so many welcome new products? There had been so many more advances to help these young mothers, thanks to new remarkable products and knowledge to meet the new way of modern living. DDT was the dawning of a whole new age of safety and dependability. 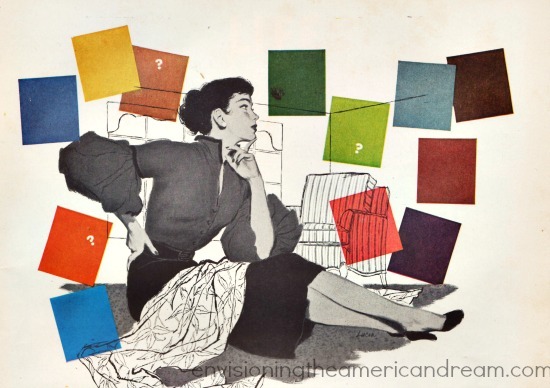 Giddily grasping the brochure, Mom’s thoughts drifted back to a few months earlier when she walked from room to room in the model house, mentally installing furniture and decorating it’s rooms. Pausing in the coziest sunniest one of the three bedrooms she lingered, imagining how perfect it would be for her not yet- born- not- yet- determined-new baby girl. 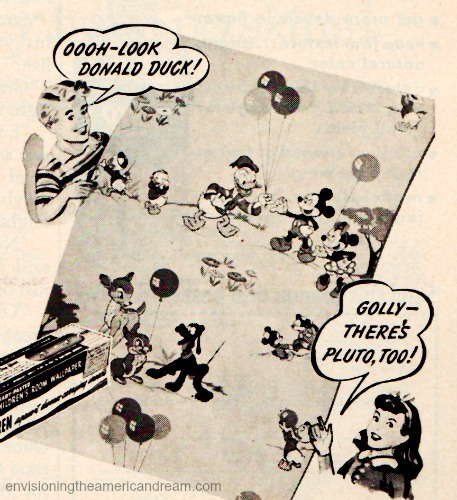 Smiling now, she envisioned the walls covered with loads of playful prancing kittens and lambs gambling through the room awash in a sea of DDT. Mom couldn’t wait for Dad to head on down to the hardware store, load up on Trimz wallpaper and start papering the nursery. While Mom and I were in the hospital for our 10 day maternity stay, Dad could get busy on the finishing touches of the nursery. My Dad like many mid-century Dads had been left out in the cold during most of the pregnancy, but now would be his time to shine. The first day in April was a sunny one; it was the perfect day to tackle the wallpapering job. Installing the paper would be a breeze! “Ready Pasted! Just dip in water and hang!” the instructions boasted. It would be finished way before my April 8 homecoming. Dad happened to be a big booster of the ingeniously new DDT. He called it an Atomic Vermin Destroyer. “They said it couldn’t be done, they said nobody could do it,” Dad bragged. But that didn’t stop American know how. This was the wonder chemical that had saved thousands of lives during the war. It had been sprayed heavily on the South Pacific Islands where Dad served and he would proudly tell us how this wonder insecticide had saved lives from malaria carrying Mosquitoes. In fact, soldiers were issued DDT powder to sprinkle on their sleeping bags with no adverse effects. 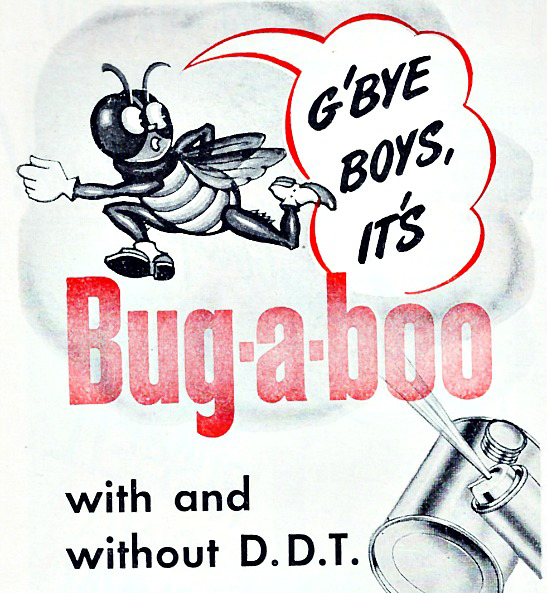 After winning a victory during WWII, DDT shucked its military clothes, and came home a hero to take over the number one spot in Americas bug battle. DDT was like a good insurance policy. Surveying the nursery Dad thought of the task ahead of him, but it was nothing compared to the long task ahead. That was a job for a long time. Now that he was the father of 2 he knew how important life insurance was. His new baby deserved the best of everything within his power. Just as insurance would safeguard his children’s future, so this protective wallpaper would safeguard me. Fortunately I would be well protected. 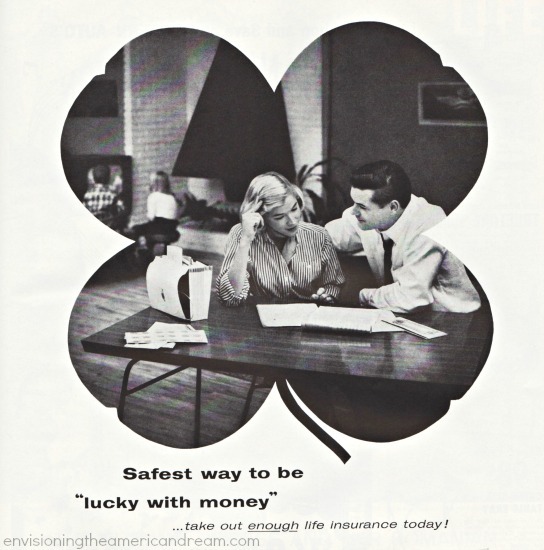 A 1955 baby didn’t need a four-leaf clover to be lucky. With DDT, your family could approach the dreamed of day of a healthy home. It came in refreshing pine scented too, to bring s touch of the outdoors inside. I remember well how in the 1950s the city crews drove up and down alleys in mosquito season with their truck-mounted foggers, dousing mosquitos, children, vegetable gardens, and household pets with DDT. We had a weeping willow in the backyard, close to the alley. After a season or two of the DDT fogging, a scale insect infested and killed the willow. The natural enemies of the scale insects were wiped out in the fog. I enjoyed the article, but it was short changed. Any mid-century DDT discussion truly must mention the gravity and impact of Rachel Carson and her work, Silent Spring, had on the pesticide industry. Even President Kennedy had to give the matter attention.